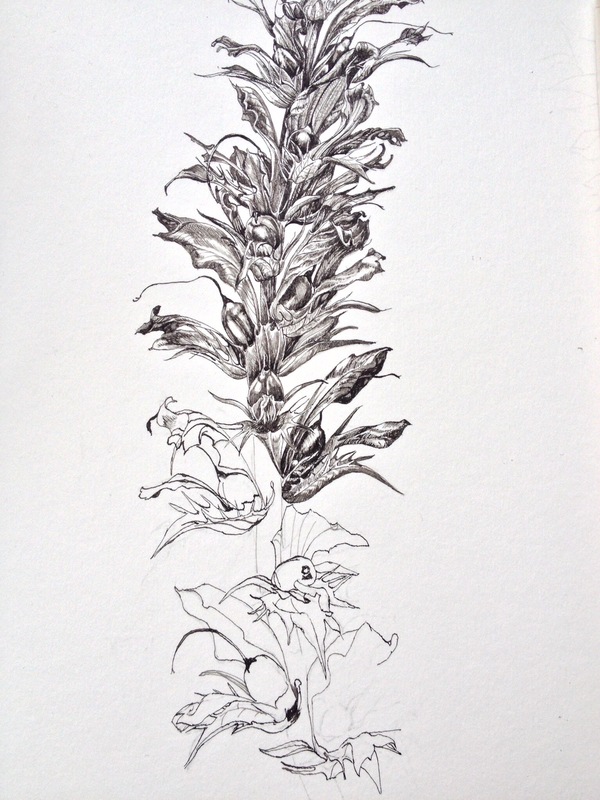 There has been little time to do the pen & ink drawing of the Bears Britches as I have been organising the co-ordinated exhibition between Palmengarten and the Society of Botanical Artists; or at least everything from the UK side of things. 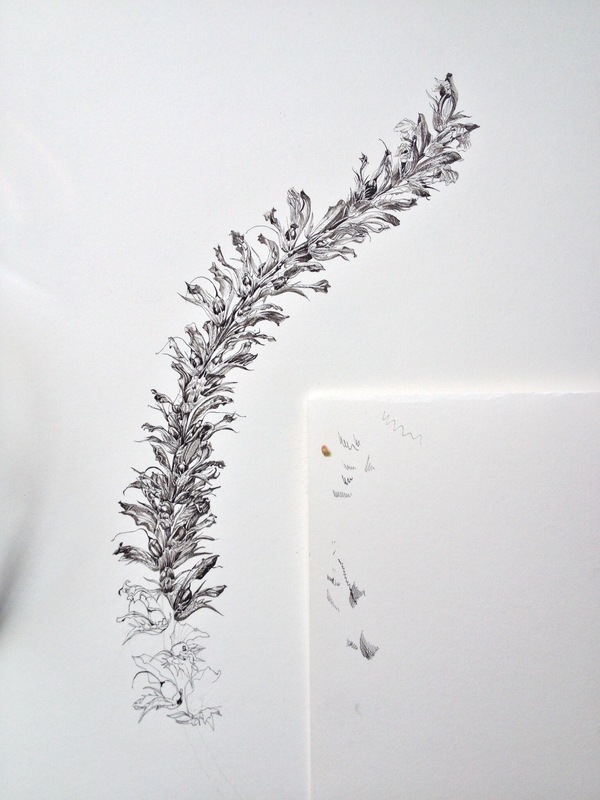 Additionally I have had to keep on top of marking assignments as the botanical art tutor for the London Art College. So, the Bears britches has been done at stolen moments of time. Last weekend however, The London Art College had their annual meeting of tutors just outside Bristol. It was a very nice break away from everything that had to be done, and being able to talk with the other tutors at the college. A very welcome recharge of batteries before the final Palmengarten onslaught. 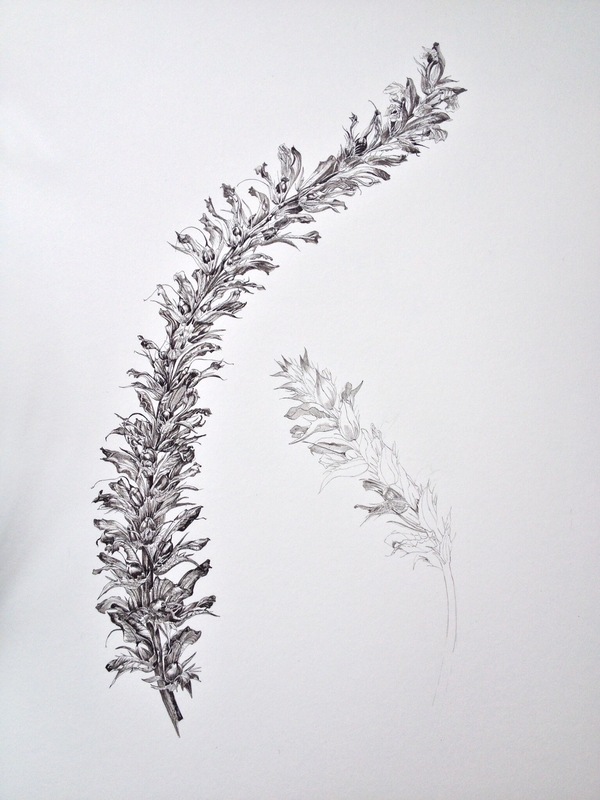 The exhibition at Palmengarten starts with the official opening and private view next Thursday evening, 23 October. There will be 205 exhibits from SBA members around the world, from as far flung places as New Zealand, Japan the USA, France and of course the UK. This is the third time that The Palmengarten Gardens and the SBA has liaised in this way. The first time was in 2010, then 2012 and now the largest exhibition will be this year. The exhibition will be open to the public from Friday 24 October until 23 November 2014 and I think will be well worth a visit. Some of you may well have picked up from earlier blogs that I have been working on this, together with Sue another SBA member in Germany. It is thanks to her that the exhibition is happening in the first place, so our members have a lot to thank her for. I intend to write a blog as the actual preparation is happening. I have received half of the exhibits in our home over the last few weeks. The remaining half have been collected in Kent. My husband Robin is collecting a van on Friday and with this we will make our way to Germany, collecting the rest of the pictures on the way, arriving on Sunday evening. I will be glad once we are on our way as setting up is the fun bit – other people are then involved and the load will be shared rather than mostly on the shoulders of Sue and I. The first couple of pictures are from our guest room. It will be lovely to have it cleared for a short while! Now a couple pictures from the progression of the Bears britches. Wow! The pen and ink work is gorgeous! Elisabeth, you are lovely. It’s far from finished yet, so I have plenty of time to mess it up!